Every summer, thousands of dogs — many just puppies — are killed during the ten days of the Yulin Dog Meat Festival. And it's going to happen all over again, unless people like you speak out to stop this year's horrific festival. One of the most terrifying things about the annual festival is that many household dogs, cats and other pets are abducted by kidnappers trying to make a quick buck as the dog festival begins. Local animal lovers often try to buy the dogs before butchers can, but dog sellers often refuse to sell to activists. The good news is that the Chinese government is feeling the pressure to stop the Yulin Dog Meat Festival. 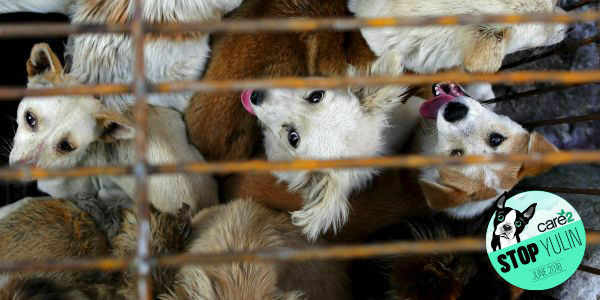 During the first few years of the festival, which began in 2009, between 10,000 and 15,000 dogs were killed each year. However, due to worldwide outrage, that number has dropped to about 1,000 in recent years due to restrictions on how many dogs vendors can sell. Tens of thousands of dogs have been saved, but we can't stop until zero dogs are killed for the festival. Sign the petition urging Chinese President Xi Jinping to save the puppies and stop the 2018 Yulin Dog Meat Festival now!